St. Cecilia's Church, West Bilney. This small, unassuming church has been here for longer than it seems. Although the windows and the tower were probably built in the fifteenth century in Perpendicular style, outside the church, on the north side, a narrow round-headed blocked-up window is visible just to the left of the buttress. It seems to be Norman, and so part of the church at least has been standing here for the last 900 years. 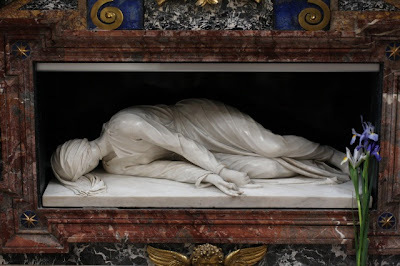 The picture is of the tomb of St Cecilia at Trastevere in Rome. The church is the only one in Norfolk dedicated to St. Cecilia, the Patron Saint of music. A concert is normally held annually, but no longer on her feast day, 22nd November, without electricity, it is too cold and too dark! The village which supports the church is also small, and for much of its history the church has shared a rector or curate with Pentney. And probably because the village was small, the church was not always well looked after. In 1597 Bishop Redman's visitation thundered, "The chauncell is decayed for it wanteth thatchinge." The curate, one Cooke, was sloppy: "He receaveth to the Communion those which have not been confirmed." In 1753 a faculty was applied for "to demolish and lay waste the Chancel". The lead off the roof was sold with two of the three bells to pay for repairs. Since then, St. Cecilia's has not had a chancel. The remaining bell is dated 1710 and inscribed, "Thomas Newman made mee R.D.W.C.C.W." On both the north and south walls of the church it's easy to see a clear join, where the masonry seems to have been finished off. Oddly, these joins aren't parallel, and on the south side, the bricks at the join seem to be curving to form an arch over a door that no longer exists. The roof seems to have been raised when the east end of the church was rebuilt. Still outside, on the north side of the church are two large headstops with ugly faces. At the northeast corner of the church is a shield, carved with the arms of the Freke family, landowners in Bilney in the seventeenth and eighteenth centuries. The shield is dated 1706, and surmounted by a skull with crossed bones on either side. lt may have been the one Elizabeth Freke paid for to commemorate her husband, Percy, who died that year. The shield was originally for his vault, which had been built under the chancel, and may have been placed here when the chancel was demolished. Elizabeth herself died in London in 1714, and was buried in Westminster Abbey. Eventually the male line of the family died out, and the manor was sold in 1750 to Francis Dalton of Swaffham. Dalton memorial ledger slabs can be seen just in front of the altar. Inside, the font is Perpendicular, decorated with quatrefoils inside circles. Alternate quatrefoils have a rose in the centre. Over the blocked up Early English north door hangs a Hanoverian coat of arms, dating from the very early nineteenth century. The pine pews and pulpit were fitted in 1881 , but the design of the pulpit harks back to the combined reading desk and pulpit of the eighteenth century. Why did the carpenter look backwards? Another surprise is the bier, which is unusual not only in dating back to the early eighteenth century, but also being without wheels. There are handles at the front and back for the bearers, and folding ones at the sides. In the upper chamber of the tower are interesting pieces of reused stone , probably all 12th. century; two round sections that may have been part of a pilaster; a "life belt" that could have been a small round window, and a head, probably of a monk as he seems to have a tonsure. In the winter of 1976 part of the tower battlements collapsed during a gale, and the church was closed as being unsafe. No one had the money to repair the tower, and no one knew what to do with the church either. It was even offered to a local farmer as a grain store! Plans were made to demolish the tower and make the church redundant, while the contents were to be given to other churches. 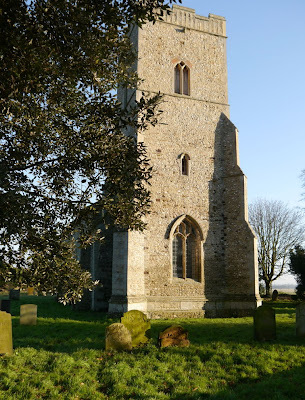 Fortunately, a Mileham farmer, Richard Butler-Stoney, steadfastly insisted that the Norfolk Churches Trust should repair the tower and take on the responsibility for the church. The Trust raised the money somehow, assisted by a grant from English Heritage. Today, the church is redundant, but services take place three times a year. In the southeast corner of the churchyard stands a substantial gravestone commemorating Ernst von Roretz, an Austrian baron who, hating Nazism, went abroad in the 1930s, and eventually settling at Park farm, West Bilney. He was not there long before he died of a heart attack whilst cutting down a tree. The church registers of births, marriages and funerals are kept at the Diocesan Registry Office. They start in 1562. The register of marriages was closed in 1967; that of baptisms, banns and burials in 1992. In July 2013 - NADFAS completed a survey of St Cecilia's at West Bilney. The church holds a copy of the report. A Study Afternoon for the Norfolk Churches Trust with Julian Litten FSA was held at the church on Saturday August 19th. 2017. Dr. Litten gave his permission to publish here notes that he had prepared for the study. Click here to see/download the document. Click on the link to see a description of the Parish Records of West Bilney held by the Norfolk Record Office.